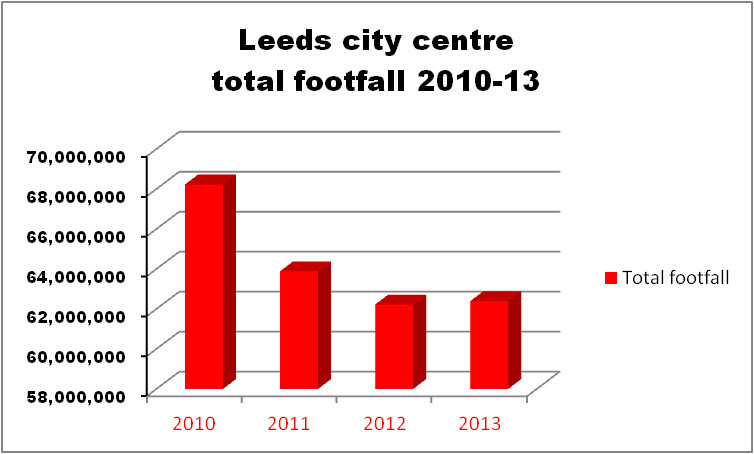 Footfall stats. For policy makers with a faith in economic recovery through SHOPPING, their “partner” developers and the PR machines of both, they’re the gift that keeps on giving. So it’s good that we now get to examine the stats for ourselves, courtesy of the council, which now posts the raw data on its Leeds Data Mill website. Except that once you look, nothing seems as clear as the PR people would have us believe. Take Leeds city centre. Been doing well of late, hasn’t it? The data shows that total footfall (recorded at the eight council cameras across the city centre) fell from 2010-12, but that the decline stopped in 2013 – the year the new Trinity shopping mall opened – when we got a 0.27% rise over the figure for 2012. A rise it is (just), a boom it ain’t. And the figure for 2013 is still 5.8m down on that for 2010, a sign (if we needed one) that the recession is still with us and many of us still feel the pinch. What about Trinity in particular? Isn’t it the perceived wisdom that it’s been having a really positive effect on the number of people visiting the city centre? That was certainly the hope. No better gauge of its effect than the data for the year before the mall opened, and the year after. And the result? It doesn’t seem to have made much of a difference to the city overall. The overall numbers are flat. What’s been happening is that there’s been a shift in the parts of the city centre people have been visiting. On the right are the eight cameras. 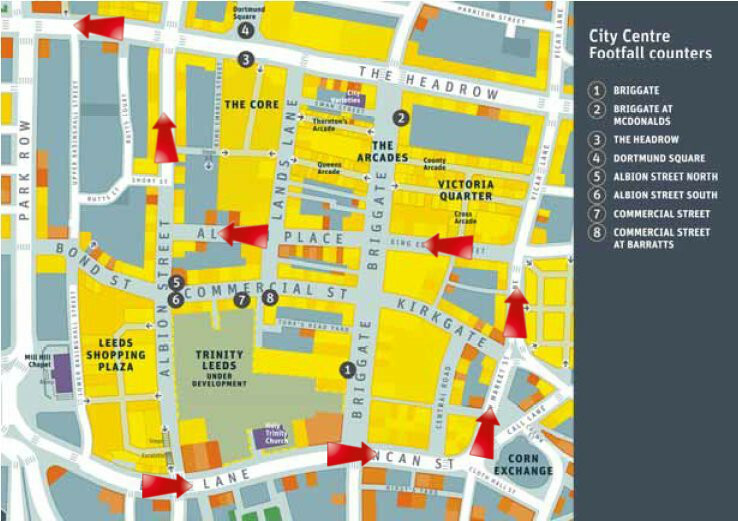 The black circles are the cameras where footfall was up in the year after Trinity was launched, compared to the year before. 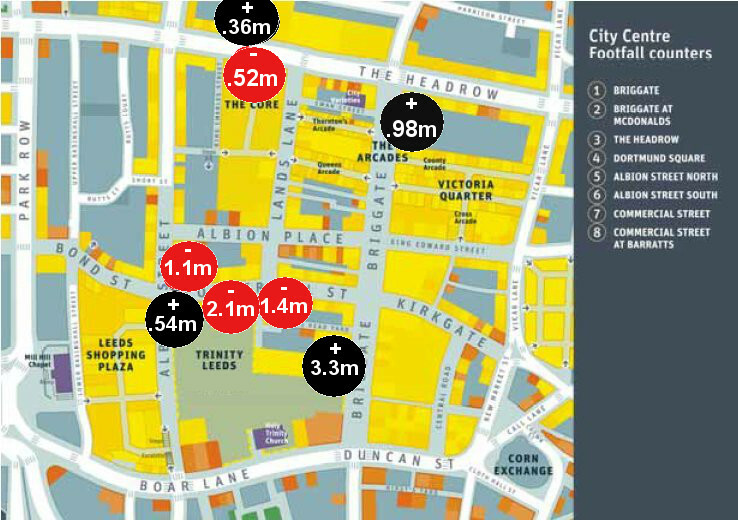 The red circles are the cameras where footfall fell over the same period. … but an equally massive drop recorded by the two cameras on Commercial St and the one on the northern side of Albion St.
Dortmund Square has been holding its own and Macdonald’s on the top of Briggate did well in 2013 too. gravity had shifted and left them out on a limb. So what’s happening now that Trinity is no longer a novelty? If you look at the first six months of this year (click on the panel on the right), total footfall recorded by the cameras is a million down on the same period for 2013. Even the Briggate camera by Trinity is down, probably not surprising given the 2013 figures included the initial fever with which people visited the new mall. … and back to City Square via the Lapdance Quarter? I wouldn’t be seen by a single camera. Hmmm. Maybe time for a rethink on where they’re placed. Are there other footfall cameras in the city centre that might help give a more accurate picture? They’ve got some at Kirkgate Market (but the council doesn’t publish the data), Trinity has got its own, as does the St John’s shopping centre. They’ve probably got some at the Merrion Centre too. But the private ones don’t share the results. This entry was posted in Uncategorized and tagged footfall, leeds, leeds city centre, leeds city council, shopping, trinity leeds. Bookmark the permalink. I agree – you only have to visit Leeds to notice the shift, but of course as you point out, the figures produced by the cameras will be skewed by their location and the blindspots. Is there another data source? Numbers on buses/trains? Car park use?